Aritaya Ryokan was founded in the Taisho Period (1912 to 1926). 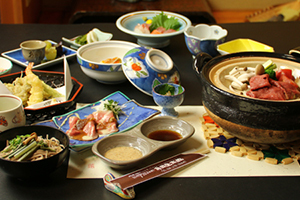 The name of our inn is derived from the fact that the founder was engaged in the peddling of Arita ware from Saga Prefecture. 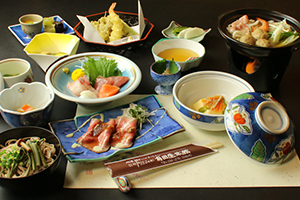 We will serve you seasonal dishes of Shinshu placed on Arita ware vessels. 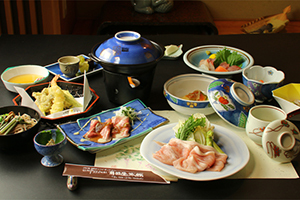 Please enjoy a relaxing time here with hospitality that cherishes the devotion of Aritaya among nostalgia and comfort. 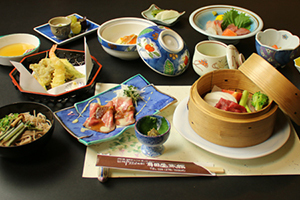 We are committed to freely using Arita ware porcelain in our inn – from Arita ware vases and ornamental porcelain (e.g. jars) to the dishes and bowls we serve our cuisine in. The night views overlooking Zenko-ji Temple from Obasute looking out even onto the streets of Nagano City are a must see. Please also enjoy the famous Japanese landscape of tagoto-no tsuki (moon reflected in rice fields on a hillside). 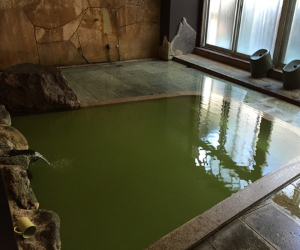 Togurakamiyamada Onsen is located between Shinshu’s Matsumoto and Nagano. This hot spring wells up from over 50 sources. 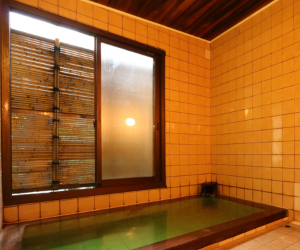 You can enjoy hot springs freely flowing from these sources at accommodation facilities and sento (public baths) in the area. There are two hot springs – one small and one large – that take water directly from these sources in Aritaya. 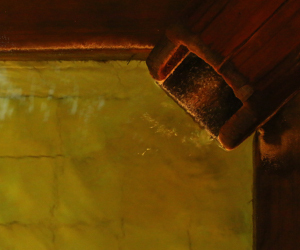 These hot springs are filled with this water that is reputed to gently adapt to your skin with a blend of nine different sources. You can use these hot springs 24 hours a day. You can savor the cloudy color of the hot water when the temperature drops in winter. There are also times when white yubana (mineral deposits resembling flowers) bloom in the tubs because these are natural hot springs. Please enjoy your bath together with the scent of the hot springs. 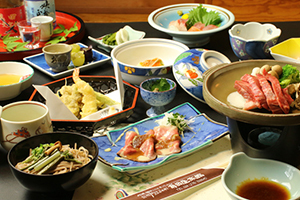 We serve cuisine that takes advantages of the raw ingredients in the land of Shinshu for dinner. 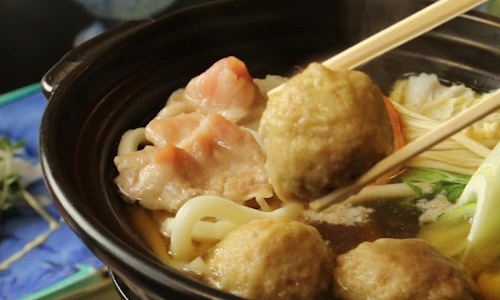 We have our recommended mochi pork shabu shabu (boiled quickly with vegetables) course, our slightly luxurious Shinshu Alps beef toban-yaki (ceramic plate grill) and reasonable proprietress’s special tsumire nabe (meatball hot pot). In addition, you can enjoy our young master’s special roast beef, homemade smoked food and young proprietress’s dessert. 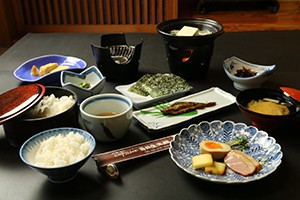 We grill nori (seaweed) that is a specialty of the Ariake Sea in Saga Prefecture and serve it together with rice produced in Shinshu for your enjoyment. 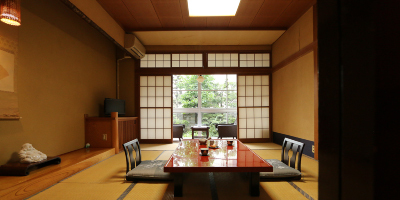 Our inn is a space where the refinement of the Taisho Period (1912 to 1926) still remains. We have no elevator or similar facilities because we want you to cherish the history and elegance here. We also have rooms on the first floor, so please contact us if you are worried about the stairs. 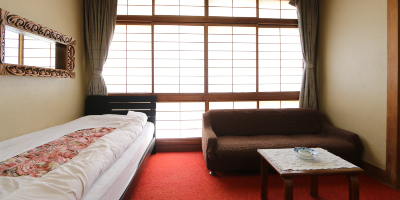 The hospitality of Aritaya will allow you to spend your time relaxing in comfort. Once you enter the entranceway and proceed down the cobbled corridor where the hot spring curtain flutters, you will find this Japanese-style room overlooking the garden. This is a room with a bidet toilet. This is our standard eight tatami mat Japanese-style room. 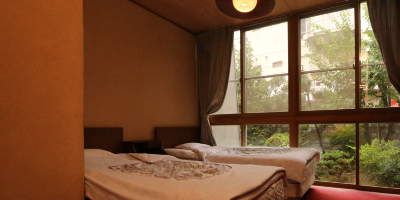 This is an eight tatami room with two beds. This is a room with a bidet toilet. 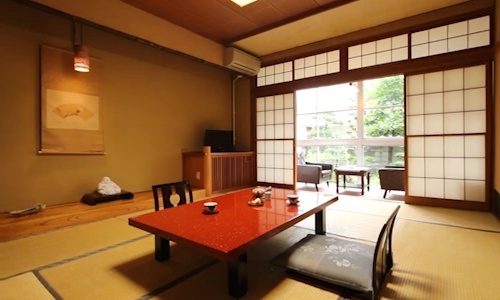 This is a ten tatami mat Japanese/Western-style room with one bed. We recommend this for families. This room comes with a basin and toilet, so you can bring small children here with peace of mind. 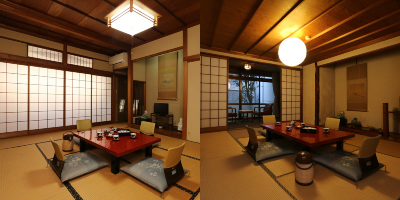 This is a ten tatami mat Japanese-style room. We recommend this for those traveling alone. ※There is a separate 150 yen hot spring tax per adult. ※We will come to pick you up at Togura Station. Please contact us in other cases.